1871 U.S. Revenue stamp for 1/6 barrel of beer ---- Brewers would receive the stamps in sheets, cut them into individual stamps, cancel them, and paste them over the bung of the beer barrel so when the barrel was tapped it would destroy the stamp. An excise or excise tax (sometimes called a special excise duty) is an inland tax on the sale, or production for sale, of specific goods or a tax on a good produced for sale, or sold, within a country or licenses for specific activities. Excises are distinguished from customs duties, which are taxes on importation. Excises are inland taxes, whereas customs duties are border taxes. an excise is typically a per unit tax, costing a specific amount for a volume or unit of the item purchased, whereas a sales tax or VAT is an ad valorem tax and proportional to the price of the good. 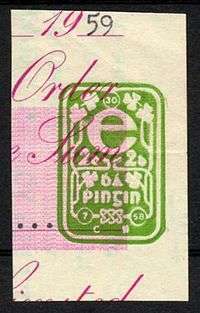 The etymology of the word excise is derived from the Dutch accijns, which is presumed to come from the Latin accensare, meaning simply "to tax". In India, an excise is described as an indirect tax levied and collected on the goods manufactured in India. The Australian Taxation Office describes an excise as "a tax levied on certain types of goods produced or manufactured in Australia. These... include alcohol, tobacco and petroleum and alternative fuels". In Australia, the meaning of "excise" is not merely academic, but has been the subject of numerous court cases. The High Court of Australia has repeatedly held that a tax can be an "excise" regardless of whether the taxed goods are of domestic or foreign origin; most recently, in Ha v New South Wales (1997), the majority of the Court endorsed the view that an excise is "an inland tax on a step in production, manufacture, sale or distribution of goods", and took a wide view of the kind of "step" which, if subject to a tax, would make the tax an excise. Monies raised through excise may be earmarked for redress of specific social costs commonly associated with the product or service being taxed. Tobacco tax revenues, for example, might be spent on government anti-smoking campaigns. Many US states impose taxes on illegal drugs. These taxes are not considered revenue sources, but rather exist to allow governments greater leverage for punishments based around the concept of tax evasion – which can be imposed in the event that the perpetrator is caught and tried. These are the three main targets of excise taxation in most countries around the world. They are everyday items of mass usage (even, arguably, "necessity") which bring significant revenue for governments. The first two are considered to be legal drugs, which are a cause of many illnesses (e.g. lung cancer, cirrhosis of the liver), which are used by large swathes of the population, both being widely recognized as addictive. Gasoline (or petrol), as well as diesel and other fuels, meanwhile, despite being indispensable to modern life, have excise tax imposed on them mainly because they pollute the environment and to raise funds to support the transportation infrastructure. Excise (often under different names, especially before the 15th century, usually consisting of several separate laws, each referring to the individual item being taxed) has been known to be applied to substances which would in today's world seem rather unusual, such as salt, paper, and coffee. In fact, salt was taxed as early as the second century, and as late as the twentieth. Many different reasons have been given for the taxation of such substances, but have usually – if not explicitly – revolved around the scarcity and high value of the substance, with governments clearly feeling entitled to a share of the profits traders make on these expensive items. Such would the justification of salt tax, paper excise, and even advertisement duty have been. The window tax was introduced after controversy arose around the introduction of income tax, which was considered to be a breach of privacy. The rationale behind this was that the grandeur of a person's house, and hence the number of windows, was a visible sign of their wealth – which could, furthermore, not be hidden as income can. One way people got around this problem was to brick up their windows. In the case of poor people this was a big social problem, as they would often force themselves to live in the dark in order to avoid paying this tax. Newspapers were taxed in the United Kingdom from 1712 until 1853. The original tax was increased with the Stamp Act 1814, when it was stipulated at 4d per copy. Since this made it extremely expensive for working-class families (doubling the price of a newspaper), it was pejoratively referred to as a "tax on knowledge", with people forced to rent newspapers on a per-hour basis, or else pool money together in order to buy and share. This resulted in a situation where even out-of-date newspapers were widely sought-after. Advertisement Duty was also stipulated in the same laws and was also charged on a "per unit" basis, irrespective of the size or nature of the advertisement. Until 1833 the cost was 3s 6d, after which it was reduced to 1s 6d. In the United States, the term "excise" has at least two meanings: (A) any tax other than a property tax or capitation (i.e., an excise is an indirect tax in the constitutional law sense), or (B) a tax that is simply called an excise in the language of the statute imposing that tax (an excise in the statutory law sense, sometimes called a "miscellaneous excise"). An excise under definition (A) is not necessarily the same as an excise under definition (B). An excise (under definition B) has been defined as '"a tax upon manufacture, sale or for a business license or charter, as distinguished from a tax on real property, income or estates." Her Majesty's Customs and Excise (HMCE) was, until April 2005, a department of the British Government in the UK. It was responsible for the collection of Value Added Tax, customs duties, excise duties, and other indirect taxes such as Air Passenger Duty, Climate Change Levy, Insurance Premium Tax, Landfill Tax and Aggregates Levy. It was also responsible for managing the import and export of goods and services into the UK. HMCE was merged with the Inland Revenue (which was responsible for the administration and collection of direct taxes) to form a new department, HM Revenue and Customs, with effect from 18 April 2005. In India, for paying excise duty, the Government of India has made automation of central excise and service tax. With this, manufacturer can easily pay their excise tax online on every 5th of the following month through GAR-7. A government-owned alcohol monopoly is another way to ensure payment of the taxes. Critics of excise tax have interpreted and described excise duty as simply a government's way of levying further and unnecessary taxation on the population. The presence of "refunds of duty" under the UK's list of excisable activities has been used to support this argument, as it results in taxation being implemented on persons even where they would normally be exempt from paying other types of taxes (the reason they are getting the refund in the first place). Taxation on medicines, pharmaceuticals and medical equipment has been an issue of contention, especially in developing countries, due to the fact that this tax can result in inflated prices of ordinary and even potentially lifesaving medication, as well as raise the cost of medical procedures, sometimes forcing healthcare providers to limit the number of operations performed. ↑ Australian Taxation Office, Businesses – Excise. Retrieved July 2009. ↑ Adam Smith, The Wealth of Nations (1776), Bk.V, Ch.2, Art.IV; retrieved 2012-09-24. ↑ Samuel Johnson, A Dictionary of the English Language, Ninth Ed. (London, 1805), Vol.2; retrieved 2009-11-03. 1 2 3 Kansas Department of Revenue, Tax Types: Drug Tax Stamp. Retrieved July 2013. ↑ Stamp Act History Project, "Stamp Act, 1765". Retrieved July 2009. ↑ Archived 25 June 2008 at the Wayback Machine. ↑ Prostitution tax an option for Nevada Legislature, by Geoff Dornan, North Lake Tahoe Bonanza, 23 Mar 2009. Retrieved July 2009. ↑ "Canada Preparing to Legalize Prostitution?". , LifeSiteNews.com, 25 Feb 2005. Retrieved July 2009. ↑ "P. Duk. Inv. 314: Agathis, Strategos and Hipparches of the Arsinoite Nome" (PDF). by J.D. Sosin & J.F. Oates, University of Cologne, 1997. Mention of salt tax in early 3rd century papyrus (pp. 6–7). Retrieved July 2009. ↑ "The Salt March To Dandi". by Scott Graham, Emory University, 1998. Discussion of salt excise in 1930s India. Retrieved July 2009. ↑ Deciphering UK Window Tax The History Of An Ancient Taxation System, The Lingo Berries, 23 Oct 2012. Retrieved Dec 2012. ↑ And You Thought The Irs Was Heartless, The Chicago Tribune, 24 Oct 1999. Retrieved Dec 2012. ↑ Taxes on Knowledge, Spartacus Educational. Retrieved April 2013. ↑ "What was known as a 'Tax on Knowledge'? ", HistoryHouse.co.uk. Consulted April 2013. ↑ "Advertisement imthias" definition, Encyclopedia Britannica, 9th Edition, 1901. Retrieved April 2013. ↑ Advertisement Duty. Russian Movements. Denmark. The United States in Europe., Karl Marx, 5 Aug 1853. Retrieved April 2013. ↑ "[The] tax upon gains, profits, and income [is] an excise or duty, and not a direct tax, within the meaning of the constitution, and  its imposition [is] not, therefore, unconstitutional." United States Supreme Court, Springer v. United States, 102 U.S. 586 (1881) (as summarized in Pollock v. Farmer's Loan & Trust, 158 U.S. 601, (1895)). ↑ WHO/HAI Project on Medicine Prices and Availability, WHO and Human Awareness Institute, May 2011. Retrieved Apr 2013. Look up excise in Wiktionary, the free dictionary.